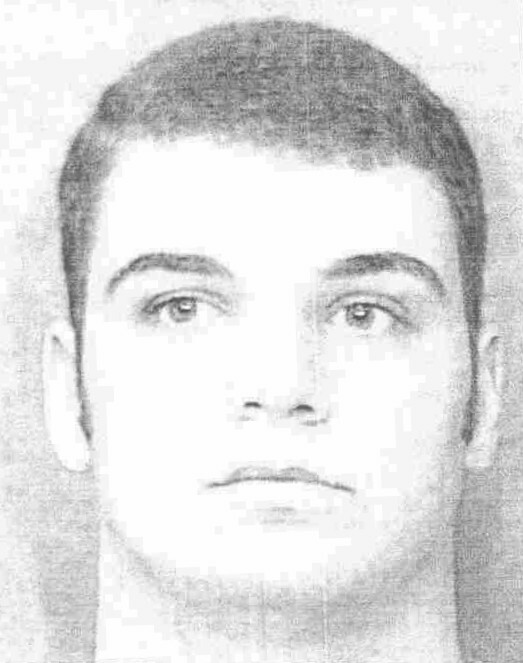 On Sept.28, 2002, my son, Greg Causey, a 24 year old student at L.S.U.-Shreveport, received a call on his cell phone at 11:30 p.m. at our ranch in rural Claiborne Parish, LA. The call was from Jeremy Powell, 25, a resident of Bossier City, LA. Powell, a convicted drug dealer, was on parole for three counts of possession of a Controlled Dangerous Substance. Greg had met Powell in 2000 through Powell's (then) fiancée, a distant cousin of Greg's. The couple came to our ranch and rode horses with Greg and me, and my late husband Ron, Greg’s father, prepared boiled shrimp. Shortly after that visit, Powell asked Greg to use his new truck to drive him to Mexico to buy prescription drugs. (We did not know of this trip until after Greg's death.) The next day Powell was arrested while selling those drugs. According to the (then) fiancée, while Powell was in jail, he asked her to bring Greg to visit him. During that visit, he tried to get Greg to sell the rest of the drugs, but Greg refused. He also asked Greg to convince Ron to act as his attorney, but Ron refused to represent him. 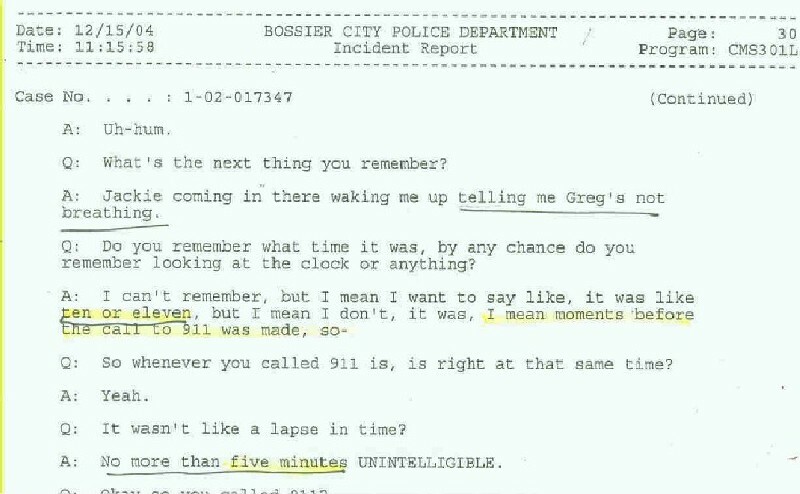 In June 2002, when Powell got out of jail, he contacted Greg. Greg had just returned from a trip to Washington, D.C. with his Political Science class and was working at the summer camp we run at our ranch. According to Greg’s friends, Greg felt indebted to Powell, because Powell didn’t tell the cops Greg was on the Mexico trip. So he accepted Powell’s invitation to go out on the town with him. Powell took Greg to a club in Shreveport. In the course of that evening, Greg's nose was broken, and the back window of his truck was broken out. Greg told family and friends that five guys had jumped him because he had flirted with one of their girlfriends. Nobody believed that story. Greg was a kick boxer and could hold his own with anybody. Some of Greg's friends thought Powell, who was not injured in the fray, was behind the incident. But Greg apparently did not hold Powell responsible, so when Powell called on Sept. 28, he again agreed to meet with him. Greg left our house at midnight and drove to Bossier City, an hour away. Because his truck was low on gas, he borrowed my truck, a Chevy Avalanche. The previous day, I had used the Avalanche to drive my husband to the VA hospital in Shreveport, where Ron was being treated for lung cancer. Ron needed to refill his pain medications -- 30 mg morphine pills and 5 mg OxyContin pills. To do so, he was required to present his empty pill vials. When we returned home, I carried the new medications into the house, but forgot to take in the sack of empty vials. So, when Greg drove to Bossier City, those were still in the Avalanche. 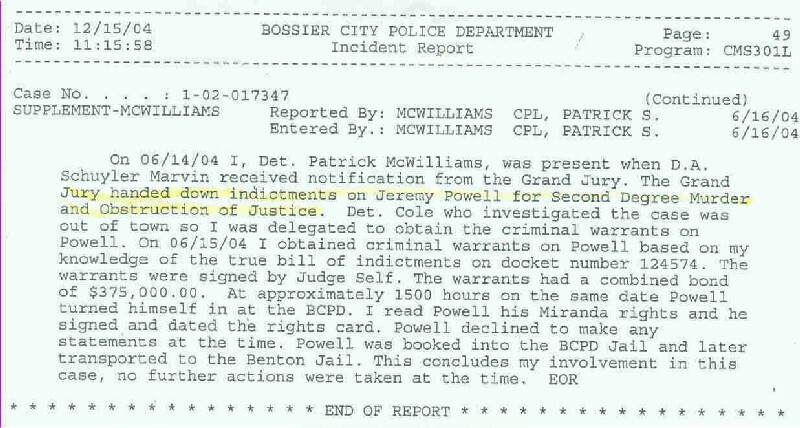 Phone records show that Powell made a number of calls that evening. At 10:42 p.m. and 11:28 p.m., he called his best friend and fellow drug dealer, Nathanial Lee Putch. At 11:31 p.m., he called Greg. He, then, made two more calls to Putch, at 12:15 a.m. and 12:42 a.m. According to police reports, Powell admitted to Detective Jeff Cole that his purpose for calling Putch was to set up a drug buy. Powell said that he took Greg to meet with Putch, and Putch sold them OxyContin and a 100 mg morphine tablet. They, then, went back to the apartment Powell shared with his girlfriend, Jacquelyn Boyter. Powell has stated that Greg purchased the pills. 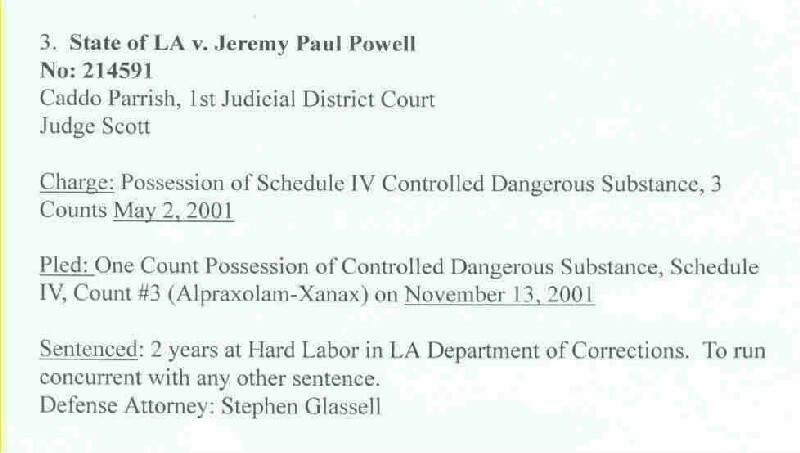 However, in a letter to my husband, who was an attorney, Powell’s attorney stated that Powell bought "his share" of the drugs for himself and Jacquelyn, who was pregnant at the time. Records show that, at 2:29 a.m. on Sept. 29, about forty-five minutes after the drug purchase, Powell again phoned Putch. Then, at 2:49 a.m., a call was made to the Poison Control Center from Powell’s cell phone. The caller gave the Imprint Number of OraMorph 100, a 100 mg morphine tablet. According to Powell, Greg slept the night on the sofa, and it was 10 a.m. when he and Jacquelyn discovered Greg was not breathing. That was approximately seven hours after the call to the Poison Control Center. Powell told Detective Cole that, as soon as he realized Greg wasn’t breathing, he immediately called EMS. 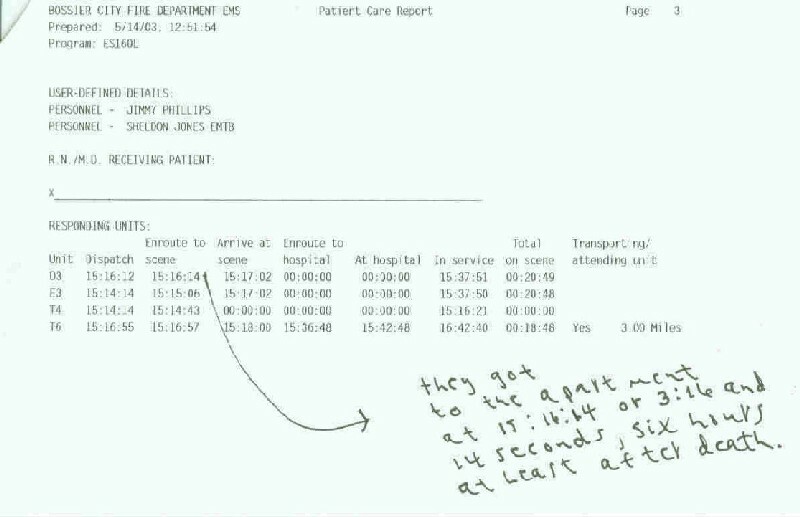 However, the EMS record shows that they were not called until 3:11 that afternoon. Three weeks after Greg died, a female friend of Greg’s, who was visiting Shreveport, ran into a man in a club who identified himself as “Jeremy Powell”. He told her that Greg had “narked him out” and he hated him and wanted to kill him. When that girl was shown a photo of Powell, she said he was not the person she had talked with. Later, when she was shown a photo of Putch, she identified him as the person who had said he wanted to kill Greg. Yet, when Putch made that statement, pretending to be Jeremy Powell, he had known that Greg was already dead. My husband and I immediately suspected foul play. We were aware that Greg sometimes used Xanax and Valium when partying and drinking with friends, but had no knowledge of any opiate use, and the toxicology report found no alcohol in Greg’s system. Ron had practiced law for thirty-five years and knew the facts of the case fit the Louisiana Statute that if someone dispenses or distributes a Controlled Dangerous Substance that causes a person’s death, the supplier is guilty of second degree murder. Ron and I met with Bossier Parish District Attorney Schuyler Marvin. He was not familiar with the statute. Initially Marvin expressed his conviction that Greg had been forced to take the drugs, as there was a very big bruise on Greg’s head which we all noticed at the funeral. Then he changed his mind. His only investigator was Bossier City Detective Jeff Cole. Cole insisted in his reports that Greg died at Willis Knighten Hospital. That was not true. Greg died in Powell’s apartment. (1) Greg died from his father’s low dose morphine and OxyContin, and the vials were found in Powell’s apartment. I have those vials in my possession, and the tag, dated 9-29-02, from the Bossier City Police reads, “From Victim’s vehicle, Chevy Avalanche.” Greg did not, as police keep insisting, bring drugs with him to Powell’s apartment. Those empty vials were in the back of my truck where I’d left them. (2) Greg had been on a three-day drug binge which led to his death. That’s absurd. Greg spent the last day of his life with his father and me and our employees, helping to organize our upcoming commercial deer hunting program. Nathaniel Putch was never questioned by the district attorney. Allegedly the Bossier City Police could not locate him. A grand jury finally convened. DA Marvin's only witness was Detective Cole. The vote to indict was six-six and had to be continued. We insisted that a former Bossier Parish Deputy, who we knew was honest, present the facts. He did, and we got the indictment. Powell's bond was set by Judge Parker Self at $375,000. DA Marvin, then, arbitrarily, dismissed the indictment! In a letter to me he stated, "I did not feel comfortable trying to get Mr. Powell sentenced to life imprisonment with no chance of probation or parole." He also said that Detective Cole did not arrest Powell because there was “not probable cause”, even though Powell was on parole and a drug death occurred in his apartment. Marvin’s long record of allowing felony drug offenders to pay into a prosecution account and then plea bargain or shorten jail time has been detailed in a report by the Louisiana legislative auditor. My husband, who, by then, was close to death, said he felt as if he had been stabbed in his heart with a dagger. He asked me to take the case to the office of the U.S. Attorney in Shreveport. I promised I would. The first Assistant U.S. Attorney I spoke with was Liddell Smith, who contacted the DEA. The DEA agent who was involved in the case was professional, diligent and thorough. He initially described it as "the case of the year." He discovered records at Pain Care Consultants in Shreveport, where Nathanial Putch and his parents got pain medications, revealing that Putch had gotten twenty OxyContin tablets the day before Greg died. Smith lost his position, and the case was assigned to Assistant U.S. Attorney Ross Owen. The DEA agent and I met with Owen in September 2005. Owen told us a Federal Grand Jury might convene as early as November 2005 on Greg's case. He said the latest date would be March 2006. He asked me to be patient. In my last conversation with Ross Owen, he told me he had decided not to indict Powell, because they wanted to use him to get Putch. The plan now was to prosecute Putch only. Soon after that, I read in the paper that Owen had gone into private practice. I could not find out who had been assigned to the case after his departure. I finally got a phone call from Jim Cowles, whom I had never heard of. Cowles curtly told me the case against Putch had been dismissed for lack of evidence. They were still perpetuating the lie that Greg had overdosed on his father’s non-existent pain pills. Later I wrote to Cowles, asking that the nine photos of Greg that I had sent to Owen be returned to me. Cowles responded that Owen had no knowledge of those photos. I wrote to U.S. Attorney Donald Washington, asking for all the documents I had sent to Owen. Those were sent from Shreveport in March 2007. At that time, I couldn’t force myself to look at them. When I began putting this narrative together, I decided to check the documents to refresh my memory. 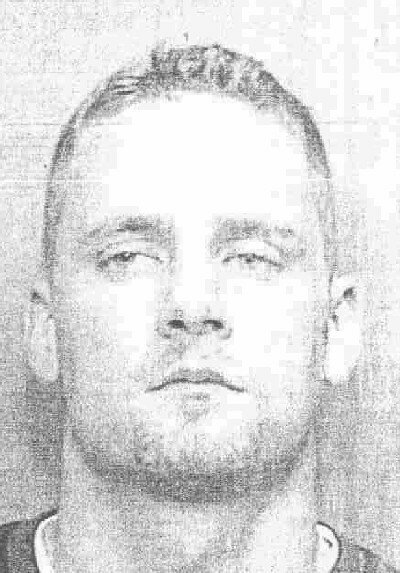 To my surprise, I found an interview that Detective Cole had conducted with Jeremy Powell, dated 6-6-03. It must have been placed with the other documents by accident. 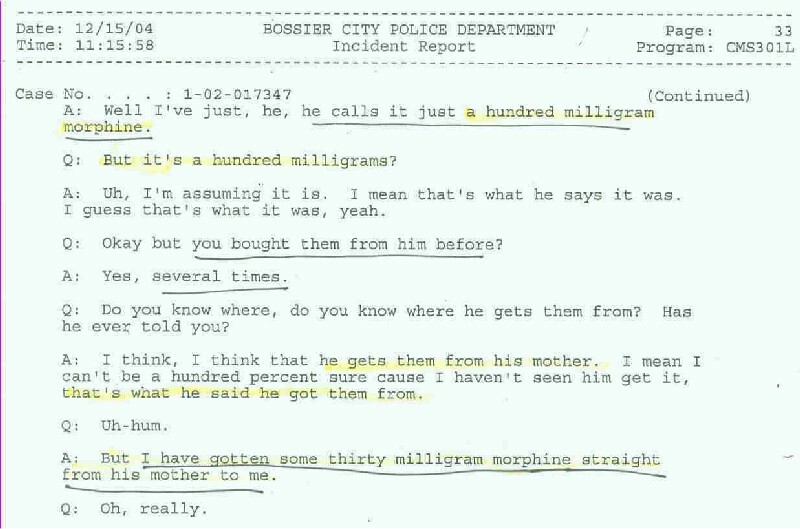 In that interview, Powell admits he got morphine from Putch on Sept. 28, 2002. He admits he bought 100 mg morphine tablets from Putch "several times." He admits he bought 30 mg morphine pills from Putch's mother, who had obtained them from Dr. Ross Nelson at Pain Care Consultants. He admits he had been buying OxyContin from Putch since May 2002. He admits that, on the night Greg died, Powell supplied Greg with one of his own prescription medications, Librium, and Greg didn’t know what the pill was. Librium would have exacerbated the effects of the two opiates. Could that call from Powell’s cell phone to the Poison Control Center have been made by Greg? Was he suddenly scared about the physical symptoms he was experiencing and trying to find out what it was that Powell fed him? Or was that call made by Powell, attempting to find out if the pills he’d fed Greg were strong enough to kill him? My life goes on. I have a daughter who is in her last year of law school. I have a business to run. But I miss and grieve for Greg every day. He had the best heart of anyone I have ever known. I no longer believe in the justice system.